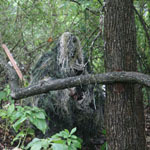 The NEW Light Weight Ghillie Suit! Full Jacket & Pants weight is just under 5 lbs. We use a No-See-Um material for the inside lining that is smooth on the skin. You can even wear a T-shirt underneath. The outside is a finely meshed nylon netting. Sewn to this netting is our synthetic jute strings. 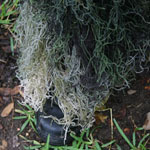 These synthetic jute strings used are much softer than the traditional jute used in other ghillie suits. 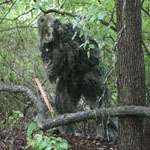 They are much like the jute strings from the Ultra-light Ghillie Suit. The result? A more comfortable suit all around for the wearer. It makes those long waits in the woods a lot more agreeable and tolerable. 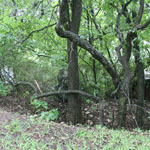 The nylon netting allows for additions of local vegatation to blend in with your surroundings. 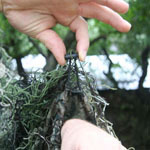 Do this by simply taking leaves, branches, and other foliage and sticking them into the netting with the jute strings. The cuffs on the suit have draw cords attached for a tight fit and to keep pests out. The Jacket has a draw cord on the attached hood and at the waist. 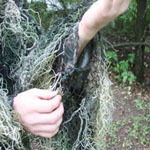 The ghillie Jacket has a zipper with a velcro cover. Velcro is sewn in to hold the flap that covers the zipper. 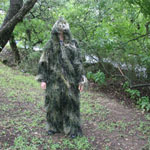 The ghillie Pants feature elastic in the waist for additional comfort and belt loops. 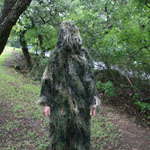 Every full ghillie suit comes in 2 different colors per suit and is available in 3 sizes. Each size runs a little larger and longer than sizes featured below. The draw cords on the sleeves and cuffs of the pants hold them securely on shorter individuals.